It is a real delight to join you for today's SCC dinner. 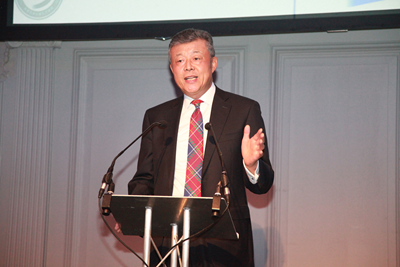 In the past seven and half years since I arrived in Britain as Chinese Ambassador, I had visited Scotland numerous times. Every time I would discover something new. I would get to know Scotland a little better. And I would take home precious memories of the natural beauty, the warm-hearted people, and of course, the Scottish whisky, strong or mellow. Most importantly, Scotland has always maintained strong and close cooperation and exchanges with China. Let me summarize the ties between China and Scotland with the word "numerous", that is, numerous visits, numerous outcomes and numerous exchanges. First, there are numerous official visits. All first ministers of successive Scottish governments have visited China. The latest was by Ms. Nicolas Sturgeon in 2015. That visit gave a strong boost to the cooperation between China and Scotland. There have been many visits in the opposite direction, too. In the past two years, nearly twenty Chinese delegations at or above ministerial level visited Scotland. Five twin city relationships between Chinese and Scottish cities were established, including the one between Xi'an and Edinburgh. They are fine examples of regional exchanges and cooperation between China and Britain. In June, Member of the CPC Central Committee's Political Bureau and Party Secretary of Guangdong Province, Mr Hu Chunhua visited Scotland. He met widely with people from different sectors and his visit was a success. 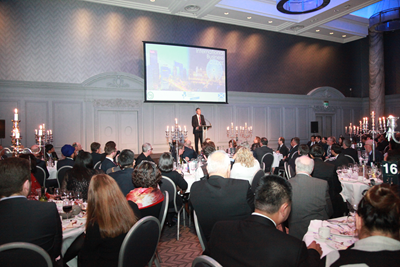 Second, the business cooperation between China and Scotland has yielded numerous outcomes. 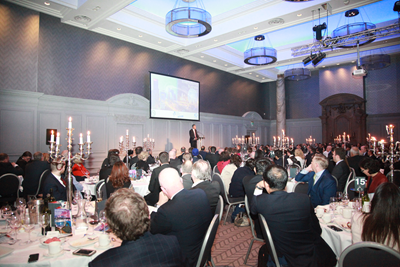 Last year, China-Scotland trade totalled 3.68 billion pounds. In a matter of ten years, Scotland's export to China has doubled. More than 50 Scottish companies have operations in China. Scottish Development International also has an office in China. Projects between Scotland and China cover a wide range of areas, from electro-mechanical equipment to building design, from renewable energy to ship building and life science. In April this year, during its first ever visit to China, the Scottish Chambers of Commerce established its office of trade representative in Yantai. I congratulate you! On the part of China, many Chinese investments have found their way into a wide range of sectors in Scotland, including energy, retail, automobile, innovation, etc. The refinery joint venture at Grangemouth, which accounts for 80% of Scotland's oil product market, is a good example. The 1.4 billion acquisition of Skyscanner based in Edinburgh by China's Ctrip last November is another example. Last week, China Three Gorges Group (CTG) and Portugese energy group EDP were awarded a 950 mega-watt offshore wind project in Scotland's Moray Firth. That means China's engineering technology application will join hands with British offshore wind R&D capability. This will be a perfect match. It will bring out the strengths of both sides and deliver a win-win outcome. Third, there are numerous cultural and people-to-people exchanges. Scotland has the world's highest coverage of Confucius Institutes and Confucius Classrooms. The five Confucius Institutes and 44 Confucius Classrooms in Scotland cover more than 300 elementary and middle schools. Nearly 30,000 students are studying Chinese language and culture. 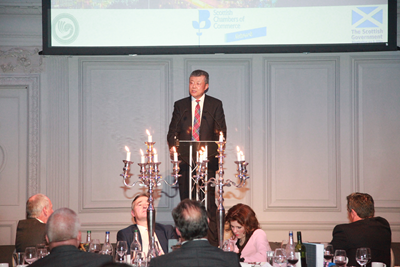 Just a few hours ago, I attended the celebration to mark the fifth anniversary of the Confucius Institute for Scotland's Schools. All 19 Scottish universities have cooperative partners in China. More than 10,000 Chinese students are studying in Scotland, making up the biggest foreign student group in Scotland. Exchanges and cooperation between China and Scotland have been particularly vibrant and effective in film-making, TV industry, museums and performing art. The world-renowned Edinburgh International Festival is Scotland's best-known cultural brand. It is attracting more and more Chinese artists and art troupes. "Boundless is the ocean where we sail with favourable winds." As we work to advance the cooperation between China and Scotland, we have three favourable winds in our sail. First of all, it is the wind of the "Golden Era". In 2015 President Xi Jinping made a successful state visit to the UK, which heralded our global comprehensive strategic partnership for the 21st century. It marked the beginning of a "Golden Era" for our bilateral ties. This year marks the 45th anniversary of the China-UK Ambassadorial diplomatic relations. It is also a year for consolidating the China-UK "Golden Era". This China-UK "Golden Era" is creating a new momentum for China-Scotland cooperation. During the G20 Summit in Hamburg not long ago, President Xi and Prime Minister May reaffirmed the shared commitment to the "Golden Era" in their bilateral meetings. Now the "Golden Era" is delivering more and more "golden fruits" in our political, business, financial and culture cooperation. Last year, China-UK trade totalled 74.4 billion US dollars. UK so far has attracted 18 billion dollars of Chinese investment, far more than any of the other European country. Every year, more than 1.5 million visits are made between our two countries. Enthusiasm for learning Chinese language and culture is rising in Britain while British culture, including films and TV dramas, also has millions of fans in China. The China-UK "Golden Era" not only points the way forward for China-Scotland friendship. It also provides a new driving force for our cooperation. The Scottish Government had issued five-year plans on cooperation with China. This had been a very positive gesture to show your commitment to deeper cooperation with China. I heard that a new five-year plan will be rolled out this year. We very much look forward to that. I believe that China and Scotland can find more new areas where our interests converge, where our respective policies align with each other and where we can engage in cooperation. This could range from local government collaboration to business and financial ties, from scientific and technological innovation to new energy, and from culture and education to tourism and health care. Our joint endeavors in all these areas will deliver benefits to the people of both China and Scotland, and contribute to the China-UK "Golden Era". Second, the favorable winds also come from the Belt and Road Initiative. This Initiative can give China-Scotland cooperation a new platform. Chinese President Xi Jinping proposed this Initiative in 2013. This is a major initiative through which China could achieve overall opening-up. This is also an important initiative to boost regional and global development. It helps make the economic globalization process more open, inclusive, balanced and win-win. It helps build a community of shared future for all mankind. Back in May, China hosted the Belt and Road Forum for International Cooperation. The Forum was a great success. Representatives from countries around the world gathered to map out plans for cooperation and development in the future. A broad consensus was reached. The list of deliverables has five categories, 76 agreements and 270 specific outcomes. This was a landmark for the Belt and Road Initiative. This Forum has ushered in a new phase as countries engaged in Belt and Road cooperation begin to turn ideas into reality and plans into actions. China regards Britain as a key partner in the building of the Belt and Road. The Belt and Road is an inclusive cooperation platform that is open to all. Under the Belt and Road framework, China and Britain have much to offer to each other in areas such as infrastructure, finance, education, law, etc. Here in Scotland, everyone from every sector is welcome to bring in your strength, take part in the Belt and Road building and make a bigger pie of common interests. In this day and age, innovation, as we all know, is key to boosting growth. China is currently working hard to encourage innovation and entrepreneurship nationwide. Smart manufacturing, internet+, digital economy, sharing economy and other innovative forms of business are growing fast in China. In Scotland, there is no shortage of inventions in your proud history, such as the steam engine, bicycle, penicillin and telephone. Today, Scotland is still a leader in innovative industries. I am impressed by your plan called "Scotland Can Do". Here, you are an international innovation centre in renewable energy, life science, information network and equipment manufacturing. The Belt and Road Initiative could provide a platform for China and Scotland to dovetail our strategies on innovative development and build a vibrant growth model. Third, China's steady economic growth is another wind blowing in favour of and bringing new opportunities for China-Scotland cooperation. China is the world's second largest economy and an important engine of global growth. For years in a row, more than 30% of world growth comes from China. In recent years, China is making great efforts to advance supply side reform and innovation-driven development. These reform endeavours are showing effect. In the first six months of this year, China's economy grew at higher-than-expected 6.9%. China's export and import of goods grew by 15% and 25.7% respectively, the highest since 2011. Against the background of sluggish world recovery, China has kept a relatively high and steady growth. At the same time, China stayed committed to an open world economy, trade liberalization and investment facilitation for the good of people around the world. China is now the largest trading partner of more than 120 countries and regions. In the coming five years, China is expected to import 8 trillion US dollars of goods, attract 600 billion dollars of foreign investment, and make 750 billion dollars of outbound investment. Chinese tourists are expected to make more than 700 million visits overseas. China's development in these aspects will undoubtedly unlock more potential and create more opportunities for broader China-Scotland cooperation. On one hand, Chinese companies will be more confident and reassured in operating internationally, including setting up business here in Scotland. On the other hand, China has adopted a series of measures to facilitate inward bound foreign businesses. These include, among others, lowering the institutional cost and optimizing market environment. I would like to stress that China will not close its door to foreign businesses. The Chinese market will be even more open to the world. Now, the Royal Bank of Scotland, Standard Life, General Accident, Scottish & Newcastle and a number of other Scottish companies have set up businesses in China. China welcomes Scottish businesses. The more the better. And Chinese consumers welcome Scottish specialties like the Scottish whisky. When First Minister Sturgeon visited China in 2015, she used four "I's" to describe Scotland's economy, and she put investment in the first place. As I mentioned just now, the past years have seen China's investment in Scotland growing fast and bringing tangible benefits to the people of Scotland. However, some British media have been claiming recently that Chinese investment poses threat to Britain's national security. I would like to respond with three "W's". The first W is win-win. As an old Chinese saying goes, "The more you do for others, the more you will gain. The more you share with others, the more you will have." For the Chinese people, win-win has long been a philosophy of life. Today, this same philosophy is guiding Chinese businesses in making overseas investment. Chinese companies are coming to the UK for opportunities of investment so that they could engage in cooperation for mutual benefit. While making profits, they help create jobs, advance green and low-carbon development, and promote economic prosperity and stability locally. Let me take the Hinkley Point C nuclear project for example. This project is partly funded by China's CGN. It is expected to create 26,000 jobs. Upon completion, it will help reduce nine million tons of carbon dioxide on average every year. Another example is the zero emission electric bus co-produced by China's BYD and UK's Alexander Dennis. More than 60 such buses are running on the road right now. This project is expected to create 660 million pounds of profit. My second W is welcome. Chinese companies have come to Britain in good faith and with sincerity. Naturally, they are hoping to find an open, friendly, fair and welcoming environment. Chinese investment in the UK mainly focuses on civilian and livelihood related areas. They are open and transparent. And they are creating tangible benefits for the British people. Some people point at the state-owned background of the Chinese companies operating internationally and claim that there might be potential security risks. But the fact is that many state-owned enterprises in China are listed companies. Their operation is similar to that of European or American multinationals. Their business performances are completely open and transparent. When making investment in the telecommunication, nuclear and other key infrastructure projects here, they strictly follow British laws on environment, health and security. They also make sure their corporate responsibilities are fulfilled. And their efforts are recognized. My third W is wisdom. The UK is in the process of Brexit negotiations, which means both challenges and opportunities. But it has been my consistent belief that there will be far more opportunities than challenges. The point here is how to seize the opportunities, address the challenges and advance cooperation. This is a test of the wisdom of our two countries. The British Government reiterates that it will stay committed to free trade, stand against protectionism, enhance business ties with partners outside the EU and build a truly "Global Britain". For international investors, including the Chinese investors, what they need most is confidence and what they want most is certainty. To reassure potential investors, the British need to "think big", namely, honouring the commitment to being open instead of tightening foreign investment reviews and creating unnecessary misgivings and uncertainties. When Chinese businesses are putting their money here in this country, they are casting their vote of confidence for Britain's future. They hope Britain will take more actions to give them the confidence they need to stay here, to convince them that their decision to invest in the UK is a right one. "He that would eat the kernel must crack the nut." "He that would travel a thousand miles must make the first step." I believe that if we get down to business and take solid steps, China-Scotland business cooperation will enjoy a more promising and sweet future. Talking about "sweet", I cannot help thinking about Tiantian and Yangguang, the two famous guests from China who have been living in the Edinburgh Zoo for the past six years. Interestingly, Tiantian in the Chinese language means sweetie. So, with the cuddly, sweet pandas in mind, I sincere hope that China-Scotland business cooperation will bear more "sweet fruits" in the China-UK "Golden Era" and the people of China and Scotland will enjoy a happy and "sweet" life.